Abstract: One of the most surprising consequences of quantum mechanics is the entanglement of two or more distant particles. Although questions regarding fundamental issues of quantum theory still exist, quantum entanglement has started to play important roles in practical engineering applications. Quantum imaging is one of these exciting areas. Quantum imaging has demonstrated two peculiar features: (1) reproducing “ghost” images in a “nonlocal” manner, and (2) enhancing the spatial resolution of imaging beyond the diffraction limit. This talk will discuss these peculiar quantum effects with particular emphasis on the physics of spatial resolution enhancement and the “ghost” imaging phenomenon. Biography: Yanhua Shih received his B.S. degree in theoretical physics from Northwestern University of China in 1981, and his Ph.D. in physics from the University of Maryland, College Park, in 1987. 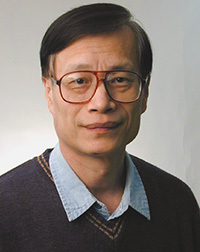 He joined the Faculty of the University of Maryland, Baltimore County in 1989 and established the Quantum Optics Program at UMBC. The Quantum Optics Laboratory of UMBC has been recognized as one of the leading laboratories in the field of quantum optics. He is currently Professor of Physics at UMBC. His research interests include fundamental problems of quantum theory and general relativity.